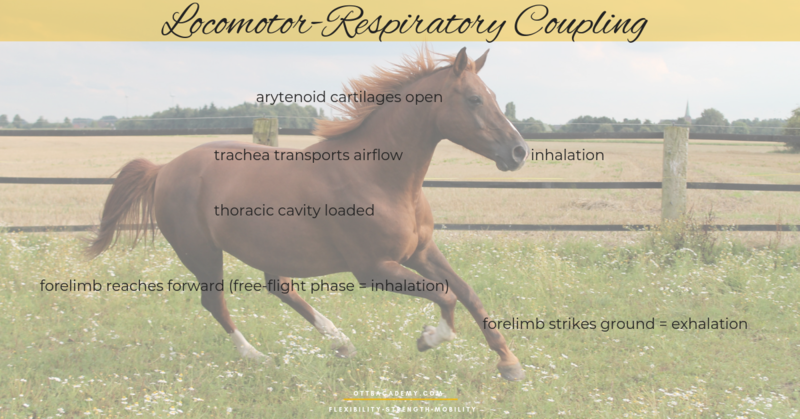 A more in-depth explanation of what's going on here is called locomotor-respiratory coupling (LRC). Quadrupeds (horses in this case), must lengthen their stride to increase speed. To increase respiratory minute volume (amount of gas/air inhaled per minute) tidal volume (the amount of air exchanged in and out of the lungs) must also be increased—because the respiratory rate is coupled with a horse’s stride frequency. Locomotion and respiration are not independent in equines because locomotion and respiration rely on a series of cyclical movements. The ribs, sternum and supportive musculature must work together. If any of these areas or supportive respiratory mechanisms are compromised in some way, constraints and limitations in breathing patterns and stride can occur. More specifically, if a horse has an airway disease. 1:1 ratio (stride and breath) Consistent stride frequency should be equivalent to respiratory frequency. To increase speed, stride must be lengthened. Air intake through nostrils (soft palate seals off oropharynx, enlarging the nasopharynx). Arytenoid cartilages (raise to open while closing the esophagus to open the larynx. The lowered epiglottis forms a seal with the soft palate). Thoracic cavity (loaded with air, minute volume through the trachea). Forelimbs strike the ground (exhalation of breath occurs). Forelimb extension for next ground contact, in free-flight phase (breath inhalation). 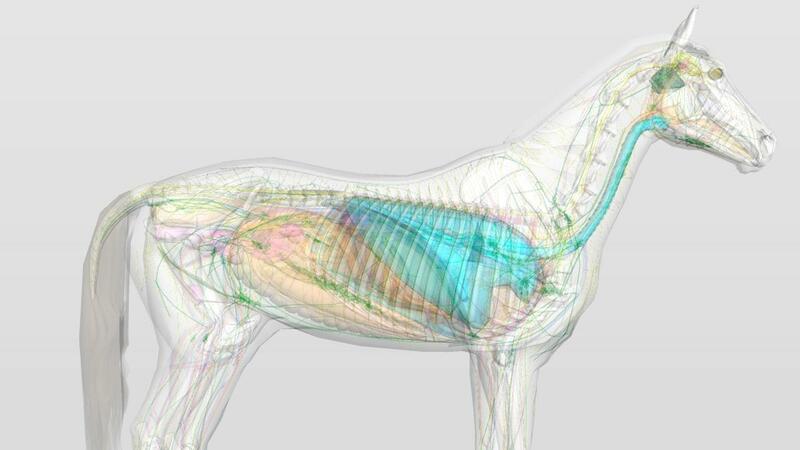 To break this down further, equine limb movement during locomotion is synchronized with respiration. Movement places constraints on breathing—which requires the respiratory cycle to be synchronized with gait patterns. In horses, the synchronized locomotor and respiratory cycles are at a 1:1 ratio (1 stride, 1 breath) over varying degrees of speed (throughout the gaits). Horses maintain a consistent stride frequency and respiratory frequency at a range of speeds. 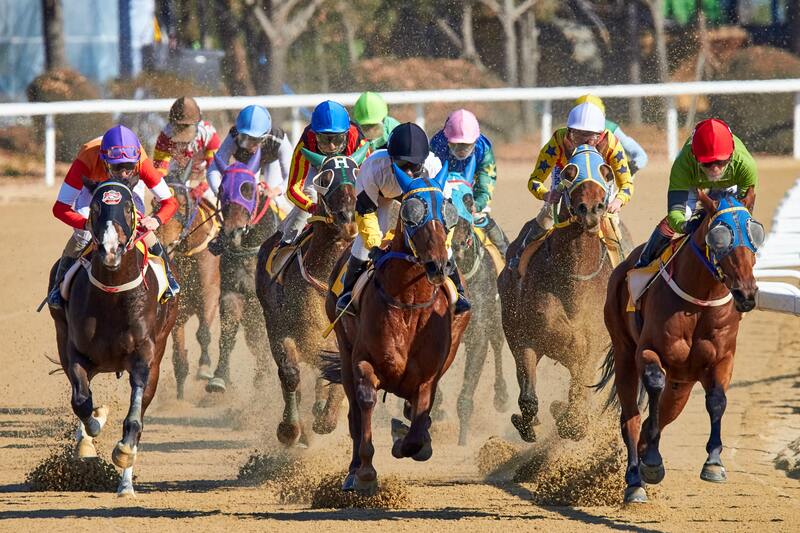 A good example of respiratory locomotion coupling is watching horses during live racing. The 1:1 ratio, synchronization of stride and breathing is both audible and visible. When a horse is racing, locomotor-respiratory coupling is at its peak, and tidal volume (air exchange) can be as high as 65–80 L/min. To increase speed, horses lengthen their stride—while increasing minute volume—and also increasing the tidal volume. This is because the respiratory rate is in fact coupled with the horse’s stride frequency. During galloping horses require a massive amount of airflow. Head position plays a factor in getting proper airflow as well as the opening of the arytenoid cartilages. The supporting laryngeal abductor muscle requires proper function or breathing will be impaired—resulting in speed or gait restrictions. Often times the result is poor performance and other symptoms may be visible, all of which require veterinary medical attention to improve equine health. Many riders and humans in general, have an unconscious habit of holding our breath. As riders, when we have inconsistent breathing patterns, this can negatively impact communication with the horse and overall riding performance. Most of us in the western world have a shallow breathing pattern—if we don't meditate or do some type of breath work. So, the next time you are working with your horse or riding them, become aware of your breathing. Use your horse as an example of how to breathe properly. The horse is a master of the breath and think of them as your mentor—let the horse guide you.